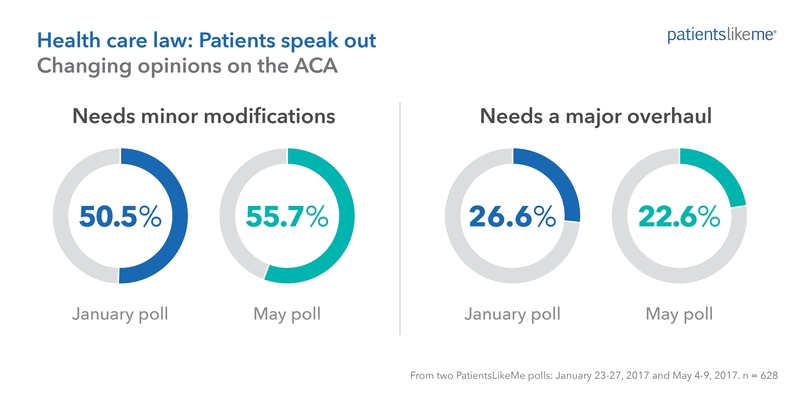 "Despite the partisan divide in Congress about what should be included in a health care plan, there is a singular voice in patients, who are agreed across party lines on the essential foundation for any plan"
CAMBRIDGE, Mass.--(BUSINESS WIRE)--In a new PatientsLikeMe poll of people living with chronic conditions in all 50 states, 2,755 patients shared their priorities for a nationwide health care plan, and showed they are increasingly in favor of modifying rather than replacing the Affordable Care Act (ACA). Nearly half (48 percent) disagree that states should be allowed to opt out of any national replacement plan, while more than one third (35 percent) agree. But when asked if they wanted their own state to opt out, just 22 percent agree with that option. 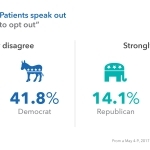 The strongest opinions about opting out were split along party lines, with more Democrats than Republicans believing that states should not be allowed to opt out. 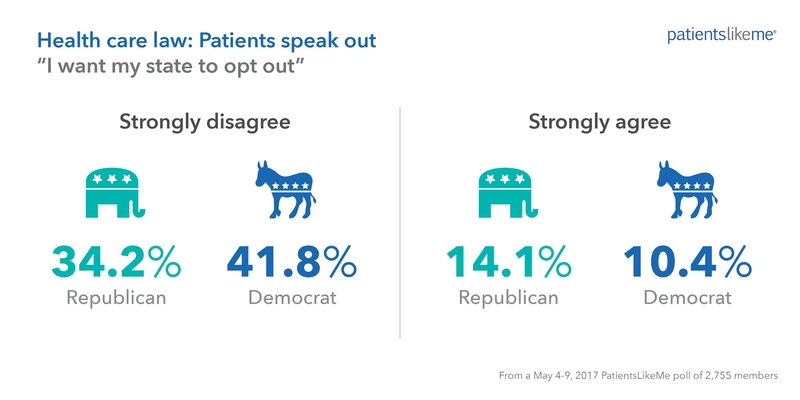 Approximately 52 percent of Democrats strongly disagree that states should be allowed to opt out, while 46 percent of Republicans do. 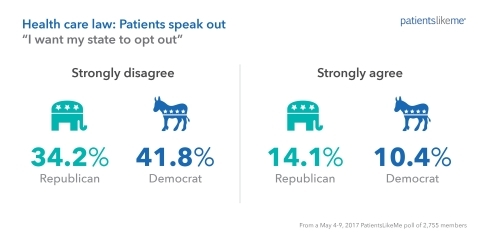 When asked if they wanted their own state to opt out, 42 percent of Democrats and 34 percent of Republicans strongly disagree, while 10 percent of Democrats and 14 percent of Republicans strongly agree. Geographic differences also emerged on the question of states opting out. The largest number of overall responses came from California, Texas and Florida, a trio that represents states with two Democratic senators (California), two Republican senators (Texas), and two senators of different parties (Florida). Texans were more than twice as likely to agree that their state should opt out of any plan (36 percent) than Californians (16 percent). Californians were one and a half times more likely to strongly disagree that their state should opt out (45 percent), versus Texans (30 percent). Florida fell somewhere in between, suggesting a connection between the opinions of a state’s residents on this health care policy issue and the political party affiliation of their senators. 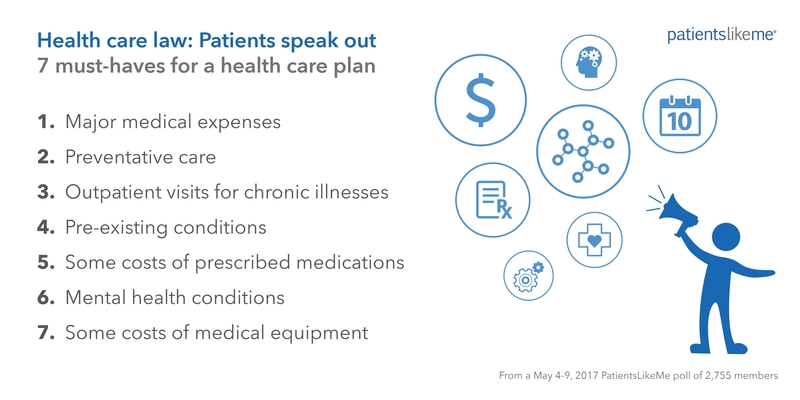 Between May 4-9, 2017, PatientsLikeMe fielded a poll of up to 25 questions to a sample of its members in the United States who are living with chronic or progressive degenerative conditions. 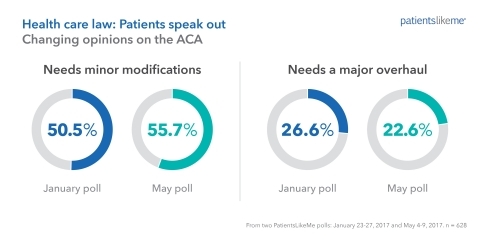 A total of 2,755 patients completed the poll, which asked original questions about preferred elements of a national health care plan and opinions about states opting out of such a plan. Respondents had a range of chronic or progressive medical conditions and listed their primary condition as multiple sclerosis (14 percent), fibromyalgia (14 percent), Parkinson’s disease (7 percent), major depressive disorder (9 percent), ALS (4 percent), among many other conditions. Close to 10 percent of respondents reported cancer as one of their conditions. The mean age of respondents was 55.1 years (the range was 18-87). 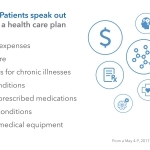 About one-third (34 percent) of patients had health insurance through their employer, more than one-third (37 percent) had Medicare; and the rest had a mix of other health care coverage including Medicaid, VA, military, and direct pay insurance, which includes insurance purchased from ACA exchange programs. 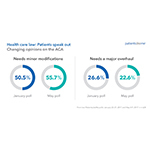 A very small percentage (3 percent) of respondents said they had no health insurance. Reported party affiliation is as follows: 34 percent say they are Democrats, 21 percent are Republicans; 20 percent are Independent; 10 percent prefer not to say; 13 percent are unaffiliated and 2 percent are Libertarian. 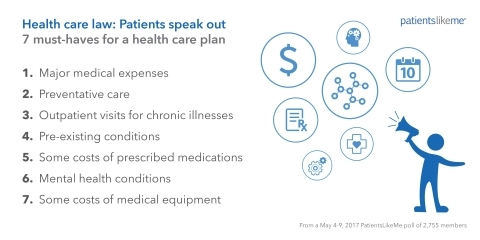 A plan that provides essential help to the most people should have no lifetime maximums for the amount paid out in coverage.